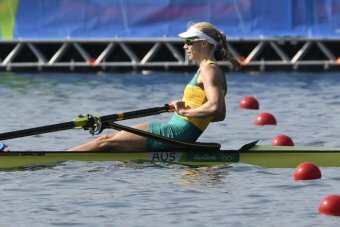 Kim Brennan has her Olympic rowing gold medal hopes back on track with an emphatic win in the quarter-finals of the women's single scull. Brennan posted the fastest times of the three races at Lagoa Stadium on Tuesday, pipping American Genevra Stone and Kiwi threat Emma Twigg. It was a return to form for Brennan, who faltered in the wind and waves in the heats on day one of racing to finish third, which was her first loss in the event since 2014. Brennan, who celebrated her birthday on Tuesday, led from start to finish. "It was good to get a solid row out and it didn't end up being too hard in the end," Brennan said. Earlier Australia's men's single sculler Rhys Grant finished second in his quarter-final to also move through to Thursday's semi-finals. The men's pair of Spencer Turrin and Alex Lloyd booked their berth in the medal race, crossing second in their semi-final with their final on Thursday. The women's double scull crew of Sally Kehoe and Genevieve Horton faded to finish fourth in their semi-final, missing the final, as did the men's double sculls crew of David Watts and Chris Morgan.